Let's face it: prayer is hard! In fact, prayer is so hard that most of us simply do not pray unless an illness or a public setting, such as saying grace at a meal, demands it. 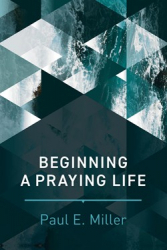 But a life of prayer can help us overcome a life of fear, anxiety, joylessness, and cynicism. Excerpted fro the bestselling book A Praying Life, these nuggets of wisdom from Paul Miller encourage Christians who want to know the joy and power of a vibrant prayer life.